In the last one year, the sales of smartphones have gone up dramatically. Today, a large number of people in India are carrying around phones which have cameras, GPS, and data connectivity built-in - and this is also having an impact on governance. For example, the Delhi Police has embraced the use of WhatsApp to counter corruption - citizens can send messages, audio and video clips to 9910641064 and expect responses from the police, instead of having to call a helpline. Earlier this year, the Delhi Traffic Police also launched an Android app that gives traffic updates, reports defunct traffic lights, and lets people complain about auto-rickshaws and taxis, amongst other things. It is a very useful application, though the interface could certainly use some improvements. The Bangalore Traffic Police also has a similar application but it goes a step further, letting people upload pictures of traffic violations for the police to review, something Delhi Police has been doing via Facebook. Both these apps have good reviews on Google Play, and show how apps can be used effectively by the government agencies, and they're just the first steps in this direction. 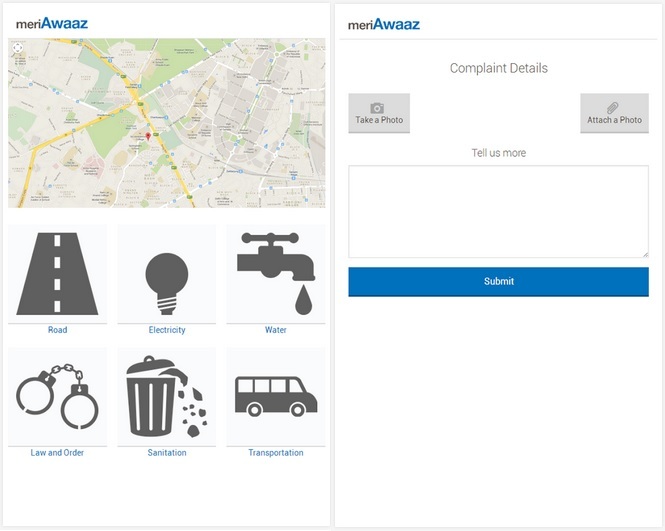 Mutiny Labs is a Delhi-based digital design company, which has just launched Meri Awaaz - an application to submit complaints to government departments. The app uses the GPS feature on your phone, to send location information about the complaint to the relevant government department. So, you take a picture of the whatever you are complaining about - this gets a timestamp, and the location details automatically - and then you use a drop down menu to select the type of problem (e.g. pothole, overflowing sewer, traffic light not functioning etc.). Meri Awaaz forwards the complaint to the city officials. Aditya Nayak, the founder of Mutiny Labs, says that the team has been talking to various government departments to set up linkages and provide a backend, so that the complaints are routed properly and responses can be tracked. "We were talking to the AAP government in Delhi and they were very enthusiastic, but the government fell apart before we could take things forward," says Nayak. "Since then, we have started talks with the Sikkim and Uttarakhand governments, which are in early stages, and have also been talking to the Municipal Corporation of Delhi (MCD) about this." Once these government bodies are on-board, the app becomes much more useful since at the moment the app is only forwarding the complaints to the public email contacts of various departments. With government involvement, Meri Awaaz would be able to integrate with government departments in a better fashion. The goal, Nayak says, is not just to make it easier to send a complaint, but rather, to bring transparency to the process of responding to complaints, so citizens can see whether any action has been taken or not. Of course, until such links are in place, the app - while very well designed and easy to use - has limited practical appeal. A similar initiative in Delhi has also been launched by the New Delhi Municipal Council (NDMC), called ClicknComplain. This Android app is focused on the smaller NDMC area. Officials are also able to use the app to respond to grievances. 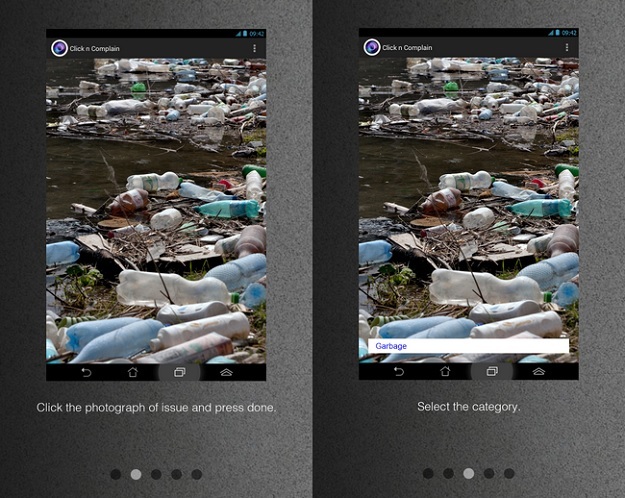 People can use the app to take a picture of any issue that needs to be resolved, select the category the problem falls under, and then upload the complaint to a central NDMC server where the officials can route it to the correct departments for faster responses. Such initiatives are a great idea and could make a real difference, but it requires the active participation of government bodies over a long period of time to be truly useful - which is something that Nayak and his team are now working hard to build. For example, the Brihanmumbai Municipal Corporation (BMC) in Mumbai had, in 2011, launched a website called Voice of Citizen, to track potholes in the city, and repair them quickly. If you look at the reports on the website, in Central Mumbai, of the 379 reports, 338 are listed as closed. In other wards, there are 6,516 reports, and 5,779 are reported as closed. These figures show how, three years after the site was launched, it is still being maintained and used by the people of the city. Without a long-term commitment, none of this would be possible, and that is something that the various government bodies need to plan for when launching all such initiatives. This is where NGOs and other third parties also have a role to play. One such NGO, Transparent Chennai, has been using Google Maps to build a GIS of the lacunae in governance in Chennai. The project was founded by Nithya V Raman, who saw Google Maps as a tool to allow the urban poor to represent their case against the urban record, and document the problems that they are facing. Transparent Chennai uses the Right To Information (RTI) to carry out initiatives like mapping public toilets, and then identifying unusable ones, to create change at the ground level. Volunteers go out into the streets, and help survey wards and collect data, while Transparent Chennai wants to create apps that will allow anyone to map zones and collect data. This kind of outside intervention can often provide the incentive for government agencies to act, and whether it is through an NGO like Transparent Chennai, or an app developer like Mutiny Labs, these small changes can lead to bigger, systematic change as well.